Eggs in your wine? I realize that concept may sound less than appealing at first. But leave it to the French to have put eggs in wine and made something glorious of it. 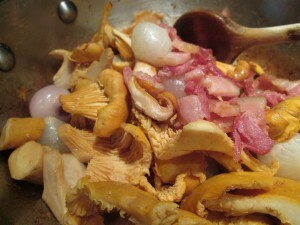 Perhaps it doesn’t hurt that there is also bacon, mushrooms, pearl onions. A bit of butter helping make a luscious sauce. If you’ve ever had oeufs en meurette–dug your fork into that pillow of poached egg, the yolk blending with the richly flavored sauce–you know how delicious that unexpected combination can be. 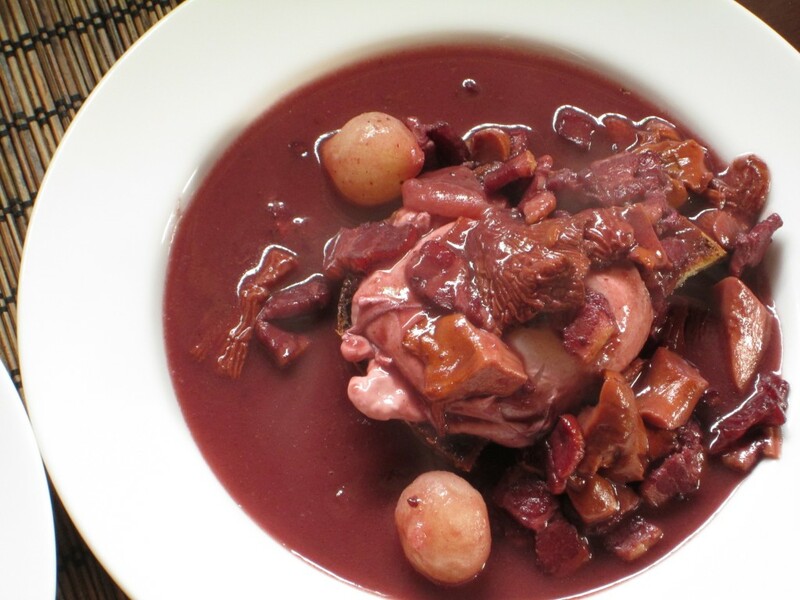 This wine-y dish is, perhaps not surprisingly, a tradition from the Burgundy repertoire of French cuisine, this sauce combination echoing the flavors associated with à la bourguignonne preparations. Maybe it’s that semester I spent at University of Dijon in the heart of Burgundy that made this dish instantly appealing to me. They make a LOT of lovely wine throughout Burgundy. And wine invariably shows up in many classic Burgundian recipes. As true as it may be that you should cook with wine good enough that you’d want to drink alongside the dish (ergo: there’s never a time for pure plonk in the kitchen), this is not an occasion to pull out a bottle of Domaine de la Romanée-Conti. That’d be taking the concept a bit too far….. Instead take, as a clue, that pinot noir is the red wine grape of Burgundy and opt for a less prestigious and more affordable (not necessarily even French) option instead. Generally speaking, my recommendations for wines to use in meurette will be those with bright character, fruit-forward flavor, little oak, only the softest of tannins. Among great options from beyond Burgundy would be cabernet franc, Rhone style wines, syrah, gamay noir, grenache — and/or blends thereof — understanding that wine-making styles for any of those grapes could produce character going beyond the suggested style for this recipe. In my Wild Mushrooms cookbook that I wrote about a decade ago, I’d included a recipe for delectable oeufs en meurette, tweaking it a bit to use wild mushrooms in place of the traditional button mushrooms. When I revisited that recipe in the process of bringing that book, and a couple others from my Northwest Homegrown series, back to life in a seven-volume ebook series, I was compelled to make it again. And I brought in a couple of wine friends to join me for the tasting, making two versions of the recipe side by side, one with a Firesteed pinot noir from Oregon, and the other a Rhone style blend called Sirocco from McCrea Cellars in Washington. The pinot noir a bit lighter, fruitier in style, the Rhone blend earthier and a bit more robust. Ultimately they both served as great foundations for the recipe. The hue of t he finished sauce varied a bit with the depth of color the wines had from the bottle. Their fruit-acid-earth spirit carried through to equal degrees. They both were avidly enjoyed by my informal panel of judges. I’m always fascinated by side-by-side tastings, whether it’s of different gins or difference species of crab, since only then do some of the finer distinctions come through when experiencing similar things at the same time. I don’t expect you to repeat the dueling meurettes in your own kitchen, one batch will be plenty to understand the distinction that red wine brings to this classic poached egg dish. Cook the bacon in a medium saucepan over medium heat until beginning to brown and some of the fat is rendered, 1 to 2 minutes. Add the onions and continue cooking, stirring often, until the onions are nearly tender, about 5 minutes. If there looks to be more than 2 tablespoons of the fat in the pan, scoop out the excess. Add the mushrooms and sauté, stirring occasionally, until tender and any liquid they give off has evaporated, about 5 minutes. Set the saucepan aside while poaching the eggs. Combine the red wine and vinegar in a large skillet over medium-high heat. 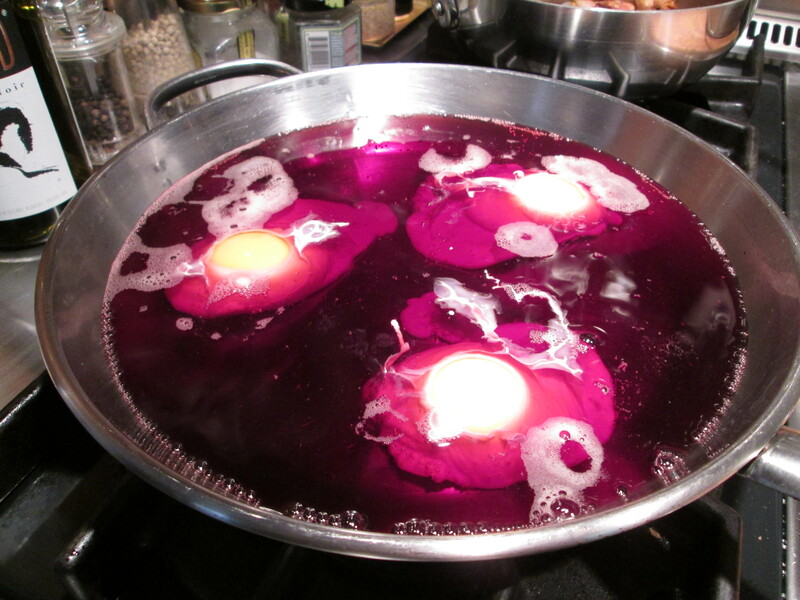 When the liquid just starts to boil, reduce the heat to medium and carefully crack the eggs into the wine. (To avoid scalding your fingers, you could first crack each egg into a small bowl, then gently tip the egg from the bowl into the wine.) Simmer gently until the egg whites are set and the yolks are still soft, about 3 to 4 minutes, gently sloshing some of the wine over the top of the eggs once or twice during cooking to help set the surface of the yolks. Scoop out the eggs with a slotted spoon and drain on a plate lined with paper towels. Strain the poaching liquid into the mushroom mixture in the saucepan, return it to medium-high heat and bring to a boil. Combine the butter and flour in a small bowl and stir well to make a smooth paste. Add the butter paste to the red wine sauce, stirring constantly as it cooks until thickened, 3 to 5 minutes. Season the sauce to taste with salt and pepper. Set a slice of toasted bread on each plate and set a poached egg on top of the toast. Spoon the red wine sauce over the eggs and serve right away. I love this dish. It is so Burgundian it hurts. Hurts so good. Fond memories of having it for the first time in Chambolle-Musigny.